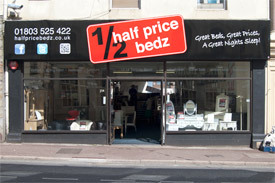 Welcome to Paignton Bed Centre, we have a huge selection of beds, mattresses, bedroom furniture and accessories. From standard pocket sprung mattresses to memory foam and special back care beds, from childrens bunk beds to adults TV beds! Why not pop in and see our Paignton showroom, just a few doors to the right of the main Post Office, opposite the Cork & Bottle pub (formerly the Old Wellhouse). SPECIALS - HPB Back Care Range - HALF PRICE while stocks last! Exclusive special offers on these fantastic orthopeadic beds, only £199 for both the bed and mattress! 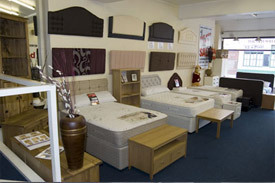 We carry a huge range of beds and furniture from great names like: Furmanac, Hartlands, Limelight, Moonraker, Prado, Seconique, Sofainabox, TenderSleep, Visco. With all the popular ranges including: Corona, Devon, Denver, Sol etc. From wooden beds to leather, bunk beds, electrically adjustable beds, ortheopedic beds, sofabeds, many with storage options underneith, optional extras etc etc. 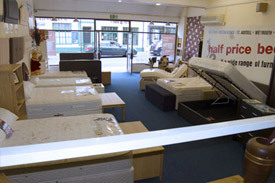 We will have something to suite your needs and your budget, why not pop in or give us a call?